The BanaBay Quality Management System (QMS) has been developed to comply with regulatory, industry, statutory, and customer quality requirements imposed by customers or regulatory agencies for items and services provided by BanaBay GROUP world-wide operations. The QMS describes the BanaBay commitments to the quality assurance requirements imposed by the Government of Ecuador, AgroCalidad, and other national/international regulatory requirements. The BanaBay GROUP Company is based in Ecuador and it has operations in the American and European markets that are responsive to the fruit supply industry. BanaBay is made up of departments that are responsible for marketing, design, procurement, manufacture, inspection, servicing, and operation of the provision of top quality fruits to worldwide recognized customers. The BanaBay Quality Management System (QMS) incorporates quality planning, provides a framework for managing the activities that enable the company to create items and services which consistently satisfy the customer, statutory, and regulatory requirements, and is a tool for achieving enhanced customer satisfaction. The QMS also provides for the continual improvement of the quality management system by monitoring processes based on their significance, measuring their effectiveness against objectives, and management selection of processes for improvement. The quality department within our organization has far reaching responsibilities on consistently supplying superior quality products. The quality department specifies the temperature and relative humidity conditions to be used for shipping our agricultural products. They are in charge of controlling our production and packing processes in order to ensure that our products follow our quality standards. This department operates as a communication link between our production, shipping and customers. Inspections are carried out at both source and destination markets in order to control product quality for sales and feedback to production and shipping. A key responsibility of the quality department is to make sure that consistent standards of evaluation are applied at all sources and markets. This is accomplished through the development of Quality manuals, training and periodic exchange visits for the quality staff. 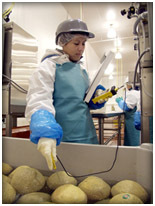 Also included in our quality department is a technical service team that provides training to supermarket clients (for example: ripening procedures, storage and handling practices) and trouble shoots problems through supply chain audits for the purpose of providing feedback to clients as well as the BanaBay Company. In addition, third parties are also employed to oversee certification systems.